Watch Joseph P. Nessler, MD, of St. 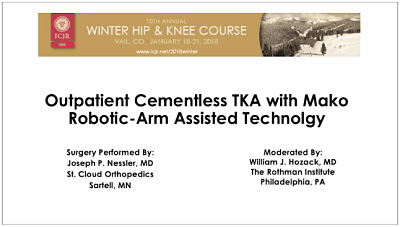 Cloud Orthopedics in Sartell, Minnesota, use robotic-arm assisted technology (Mako; Stryker, Kalamazoo, Michigan) to perform a cementless total knee arthroplasty (TKA) at an ambulatory surgery center. The procedure was broadcast live to attendees at ICJR’s annual Winter Hip & Knee Course earlier this year. Dr. Nessler’s patient is a dairy farmer with 5º to 10º of flexion contracture in his right knee. He has a moderate amount of osteoarthritis and diffuse pain. Dr. Nessler considered a unicondylar knee arthroplasty, but the nature of the pain and the stiffness in the knee convinced him to recommend a TKA instead.